Uruguay duck hunting is not to be minimized. Uruguay is a country full of rice fields and marshes where ducks thrive. Uruguay is the duck hunting is a must-do destination, especially for hunters seeking a variety of duck species such as Brazilian ducks, Rosy-Bill Pochards, or Brown Pintails. Our Uruguay duck hunting portfolio consists of lodges with succesful track records for superb waterfowl hunting. Uruguay has taken huge strides in order to attract dove hunters from around the globe. Many past Argentina dove hunters have recently commented that every year they see more and more wingshooters trying Uruguay for dove hunting. And they see why the switch from Argentina to Uruguay for dove hunting was made. Los Gauchos Outfitters offers several lodge and options for high volume dove shooting in Uruguay. Uruguay Perdiz hunting is part of either Uruguay dove hunting OR Uruguay duck hunting. The Upland hunting in Uruguay is limited to a short season - May 1st to July 31st. The bag limit for Perdiz is 10 Perdiz per hunter per day. At the Fortin Lodge you will hunt ducks in the morning and then spend the afternoon with the Upland dogs, guides, and quick Perdiz. Upland Hunting Season: May 1 - July 31. Pigeon hunting in Uruguay is a challenge and great bird hunt. Shooting pigeons over decoys can be done at 2 lodges in Uruguay. La Tany, the 5 star Uruguay Hunting Lodge, is a pigeon only destination. Los Gauchos La Paz enables clients to shoot pigeons along with Perdiz hunting and dove hunting. The pigeons in Uruguay are large - similar in size to ducks. Los Gauchos offers more Uruguay bird hunting safaris than any other South American hunting outfitters. Not only are our Uruguay bird hunting trips excellent; they represent the ultimate in wingshooting value for the dollar. All of our Uruguay bird hunting packages include shotguns. Uruguay allows clients to bring their guns into the country - you must register the gun (Los Gauchos will provide the paperwork and assist). Worry free bookings, excellent guides, tasty beef, and fine wines--are these a few of your favorite things? If so, you will want to book your Uruguay dove hunting or waterfowl hunting trip with us as soon as possible. Availabilty for the prime dates are limited--so be sure to make your reservations early. Convenience: with new non-stop flights from Miami to Montevideo, it has never been easier to book a Uruguay hunting trip. You can be in the field hunting the very afternoon that you arrive. The new terminal in Montevideo International airport (Carrasco), is open, and it has made traveling through Uruguay a pleasure. In fact, it's safe to say that the lines at the airport in Uruguay are probably shorter than in any other airport in South America--ease of travel should be a consideration, and anyone who has ever waited in line to obtain a hunting license or gun permit in Argentina understands this. Contact Los Gauchos Outfitters today - learn about our Uruguay Cast & Blast Special with unlimited dove hunting and fantastic dorado fishing. This trip allows you to fish and hunt at one of Uruguay's top lodges. Easy arrival from Montevideo OR Buenos Aires, Argentina. Uruguay bird hunting is easy. Come and find out for yourself why so many wingshooters call Uruguay their home now. The country was just built for wingshooting. Duck hunting is fantastic all season long (May to September) and dove hunting is nothing but high volume dove shooting - all year round. The abundance of bird hunting is exceptional, and the size of the country makes travel a breeze. So don't pass up an opportunity to book your Uruguay hunting trip this year. We provide Uruguay duck hunting (Fortin) with ducks all day.A great way to see Uruguay and get the best bird hunting in Uruguay - ducks - ducks and even Perdiz is you want. For those that want dove hunting and golden dorado fishing - Mercedes Lodge offers a great combo of wingshooting (high volume) and high action dorado fishing - right outside the luxury lodge - Mercedes Lodge. The Uruguay Cast & Blast is a popular hunt and is best from October to April. The fish are biting and the doves fly all day, all year. Uruguay duck hunting trips with one focus - DUCKS! The waterfowl hunting in Uruguay is still a destination that has the "off the beaten" track characteristics. With one direct flight to Montevideo, you are sure to see Los Gauchos duck hunters ready to experience some of the best duck hunting in South America. Los Gauchos Outfitters offers duck hunting trips out of 2 luxury lodges located on the eastern side of Uruguay - where the rice fields continue to the border of Brazil. 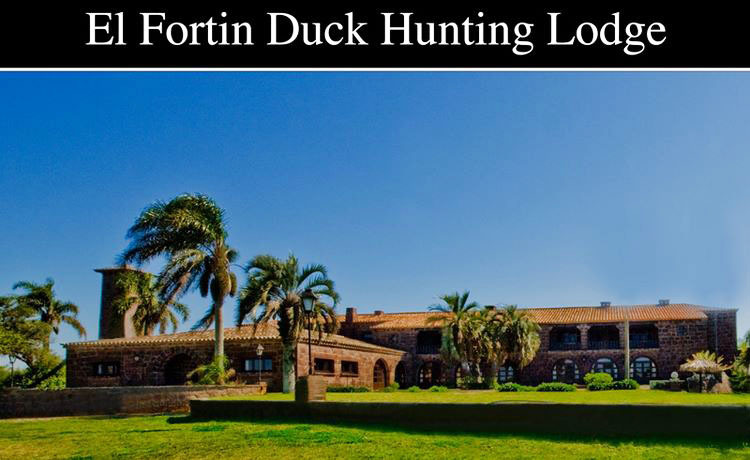 The Uruguay Fortin Duck Hunting Lodge is a Los Gauchos favorite for the waterfowl hunter or those wanting a combo duck / Perdiz hunt. Located about 3.5 hours from Montevideo, this lodge is located near rice farms with duck hunting all throughout the area. Western Uruguay is very similar to Cordoba in terms of high volume dove hunting. Year round volumes with shooting all day. This is a great Uruguay bird hunt for a 3 day weekend or quick hunting trip with volume shooting. Uruguay dove hunting is not limited to a certain season or bag limit.